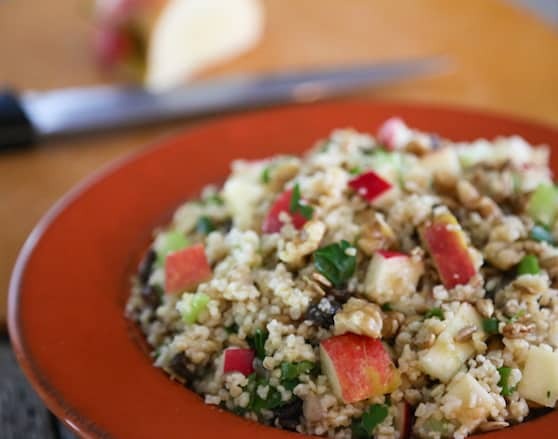 An invigorating melange of textures and flavors, this bulgur salad is also quite adaptable. Add various other fruits or veggies to it; substitute other dried or fresh fruits; or use another grain altogether, like couscous or quinoa. Photos by Evan Atlas. Cook bulgur in one of two ways: Either cover it with 2 cups boiling water in a heatproof bowl and let stand for 30 minutes. Or, combine the bulgur with 2 cups water in a small saucepan; bring to a gentle boil, then cover and simmer gently until the water is absorbed, about 15 minutes. Either way, allow the bulgur to cool to room temperature. 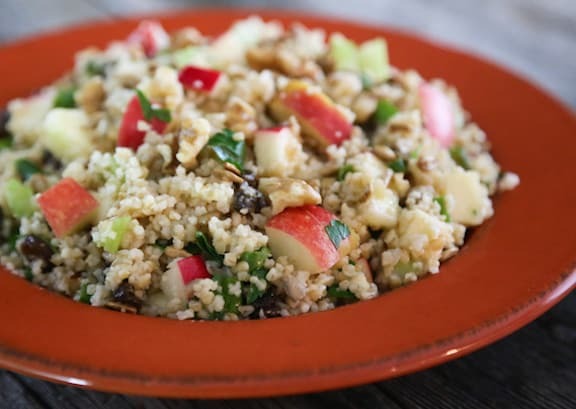 In a serving bowl, combine the bulgur with the walnuts, raisins or currants, celery, scallions, parsley, and sunflower seeds. Toss the diced apple with half of the lemon juice, then add it, along with the remaining lemon juice and the rest of the ingredients, to the bulgur mixture. Toss until thoroughly combined. Serve at once or chill until needed.